Fishing is a one of the best ways to experience the outdoors. Every location across the United States hold prime ways to get outside. Summer time is a great opportunity to catch bass across the nation. One location that is producing really well is Lake Erie in Pennsylvania. Take a trip up north and enjoy some summer smallmouth bass fishing with your friends or family next time visiting. Our local experts fish this great lake on a daily basis. One of the advantages of doing this is that when you come fishing with us, you will always be on the fish. Capt Mark Rose has been fishing this lake for many years. Bass Fishing Lake Erie is by far some of the most exciting fishing you can partake in this summer. Captain Mark had the pleasure of fishing on multiple trips this June. Craig and Mike were traveling from Pittsburgh, PA to catch smallmouth bass. They just moved from Traverse City and wanted to see what they could get themselves into on Lake Erie. This was going to be their first time adventuring out on this amazing fishery. One of their requests was a 6 pound smallmouth. Lake Erie was so close to producing what they wanted. 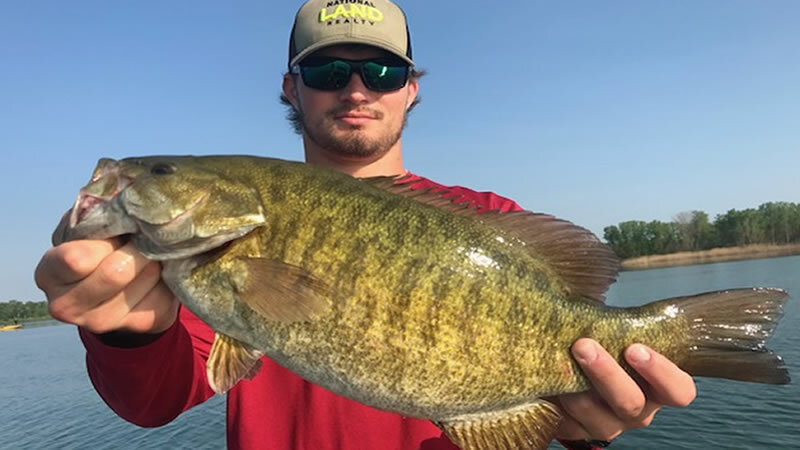 It was a quick 4 hour fishing trip where they landed a 5.91 pound smallmouth bass. Nothing beats fishing a Lake for the first time and landing your personal best. Tubes, drop shots, jerk baits and steel shad lures were all highly effective to catching the quality numbers and size. Captain Mark is looking forward to fishing with these amazing gentlemen again in the future! It was not long after this great time on the water that Taylor and Zack came out fishing on Lake Erie. They were traveling from Alabama, looking for an epic adventure on Lake Erie. This was a first time for Taylor. Taylor and Zack fished the lake for three days and enjoyed every minute. When you come smallmouth bass fishing in Pennsylvania, expect incredible days on the water. The weather was perfect for an adventure to catch some big brown bass. Over the course of their trip, they caught over 100 smallmouth bass. Taylor caught his personal best weighing 5.5 pounds. Zack also caught a huge smallmouth weighing 6 pounds measuring in at 21 inches long and 15 inches in girth. The lake and bay were all productive areas. Tubes, drop shot, jerk baits, spinner baits, shaky heads and senkos were all baits that put bass in the boat. Zack and Taylor had a fantastic time experiencing what Lake Erie had to offer them. Don’t miss out on your action to come visit Lake Erie next time visiting! Captain Mark is looking forward to landing more giants next time! Shortly after those incredible days fishing, Gary and Ben were looking to set the hook into some quality smallmouth bass. Presque Isle Bay is the perfect destination for those traveling and looking for excellent bass fishing. Gary and Ben never fished with us here at Bass Online or on Lake Erie for smallmouth bass. They have been all over to catch different species but not the hard fighting smallmouth! Captain Mark put his focus main inside Presque Isle Bay staying and fishing in the depth ranges of 3-8 foot of water. Water temperatures were holding at 65 degrees. Senkos, tubes, drop shots, swim baits and Galidas grubs were all baits that produced an excellent bite. Gary and Ben landed 35 bass with the biggest weighing 4.5 pounds. These gentlemen are looking forward to get back on the action next time they are traveling to Erie, Pennsylvania. Don’t miss out on your adventure summer Smallmouth Bass fishing on Lake Erie. The Action is hot and steady with big bass being caught. If you never experienced catching these hard fighters, make sure you add them to your bucket list and then check it off when you travel to Erie next. Bring your family, friends and love ones on a fishing adventure of a lifetime. We are looking forward to fishing with you next time we are on the water!